Last Friday, I took the game to the Calgary Game Developers work session and got some great feedback from 3 of the developers. I've incorporated most of the suggests, except one, which I will defer to later on. That one is related to how to view the tech tree, and I will add it when I revise the tech tree later in development. One of the biggest changes that cannot be shown in a blog is the ability to spin the globe with the mouse. This makes it super easy for the player to look at the planet. LEFT spins left or right. MIDDLE spins up and down. I did incorporate LEFT to do both left/right and up/down but it was very disconcerting which is why there are two buttons. 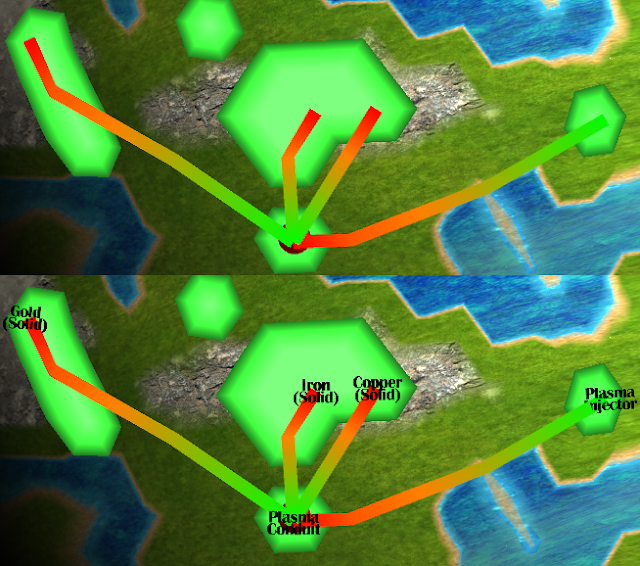 Hide and prevent hexes from being selected when they cannot be selected, and update this in real-time as buildings are added and removed. Implemented a shader for text so that at low angles to a complex, the backdrop image for one building hides labels that were behind it. Distance measuring now shows the transport route in addition to calculating the distance. It's now possible to migrate between complexes via the HUBs. Planet Aggregation is now real-time. Before you had to exit the complex to get the actual aggregation. Revised the tech tree to make it clearer how the flow worked. Revised the GIS view to make the buttons narrower so that more filters can be displayed at the same time and changed how the layers are ordered to make it easier to find. Changed the complex view to make it easier to read things. Removed the "X" icons from all views and replaced them with icons represent the view you would navigate to. Since each complex typically routes in multiple inputs and, generally, produces a single output, it made sense to identify the material that the complex produced, and this made the view much descriptive. Later on, I'll replace this text with an icon, but for now, text is good enough. I went on with the changes and now show only the labels for the inputs and outputs, and revised the colouring on the connector lines on a per complex basis. The lines show RED (start) to GREEN (end). These lines are also temporary, I'll replacement with arrows or particles later in the development. Particles are preferred because then I can use the same icons describing the outputs as particle textures. 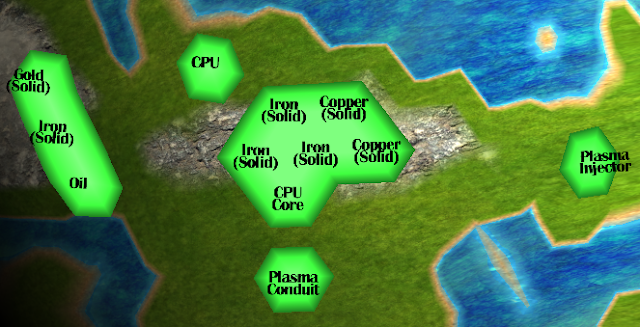 It should be clear that the formula for a Plasma Conduit is Gold, Iron, Copper IN and the output goes to Plasma Injector manufacturing.